Keeping our handsets and other portable devices fully charged, on the go. By Peter Riendeau, Marketing Communications Manager, Melexis. As the sophistication of portable consumer electronics goods continues to increase, with higher degrees of functionality and more expansive feature sets, the rate at which they drain their batteries is (once again) becoming a limiting factor. Early mobile phones, back in the mid-Nineties had battery lives of just a few hours, but as the industry sector matured mobile handsets and other items of portable gadgetry were introduced that had the ability to last for days on end without a recharge. The move to 3G and 4G mobile communications has meant that the scope of what we can do with our handsets has changed dramatically, allowing us to indulge in online gaming, watch video content, access social media and more. A recent study by Ofcom found that younger adults (18-24 years old) were on average spending nearly two hours a day on their smartphone. This change in our lifestyle has meant that the time between handheld device recharges has shortened significantly. As a result there is a clear need for a means by which charge levels can be topped up during the day. The advent of wireless charging has the potential to revolutionise the way handheld electronic devices are used on a daily basis. It will enhance the user experience and lead to greater convenience, as the devices’ power budgets will be a lot less restrictive and there will be no need for users to carry different proprietary cables around for each item of electronic equipment. Wireless charging in homes, offices and public spaces certainly looks to be an attractive prospect, but there is one particular setting where it is likely to prove highly advantageous - in cars. In-vehicle wireless charging has been discussed for several years and is now starting to see a major acceleration in its deployment. Though it follows the same basic set up as wireless charging infrastructure in other types of location, there are certain nuances that need to be taken into account that will distinguish it from normal implementations. Common wireless charging standards have built-in handshaking functions via which they can detect compatible handheld devices and then initiate charging. The sequence of polling so introduced will draw a relatively large amount of energy, which drains the car battery and may leave the car unable to start after being parked for a few weeks. At the same time, keeping RF emissions inside the vehicle at as low a level as possible is another concern, especially given the increasing number of wireless sources present there, with WiFi hotspots, mobile phone signals and such like to contend with, as well as the electromagnetic interference intrinsic to an automotive environment. NFC may hold the key to its effective implementation in automobiles. This ultra-low power, secured, short range wireless communication standard is being deployed in a broad spectrum of applications, including point of purchase and access control. NFC is on its way to becoming almost ubiquitous in the handheld device market, with nearly all of the popular smartphones already employing it or about to have it designed-in, including the Nokia Lumia, Samsung Galaxy, LG Nexus and most recently the iPhone 6. Likewise NFC is set to see widespread proliferation inside the car models themselves. Here it will perform a number of roles, such as automatic identification of the user and pairing of the mobile device to the vehicle’s media centre (e.g. WiFi or Bluetooth technologies). The NFC technology can also be used for access and start control, allowing NFC enabled handsets to be the key to secure entry and drive-away of an automobile. This is just the beginning though, as there is also the prospect for it furnishing car manufacturers with a method by which to enable greater vehicle personalisation. If the vehicle occupant’s mobile device is docked into the dashboard, then saved preference data can be used. Once automatic identification of the user has been completed the download of personal settings can be undertaken. This can allow the interior lighting or the seating positioning to be adjusted automatically to suit their liking. With NFC being employed for these tasks, it makes good sense for it to also serve as the route through which wireless charging is also initiated. It offers a very low power RF link that can be kept running all the time within the cabin. Through this the vehicle can detect if a smartphone or other handheld device is present and then carry out handshaking and begin the wireless charging process. 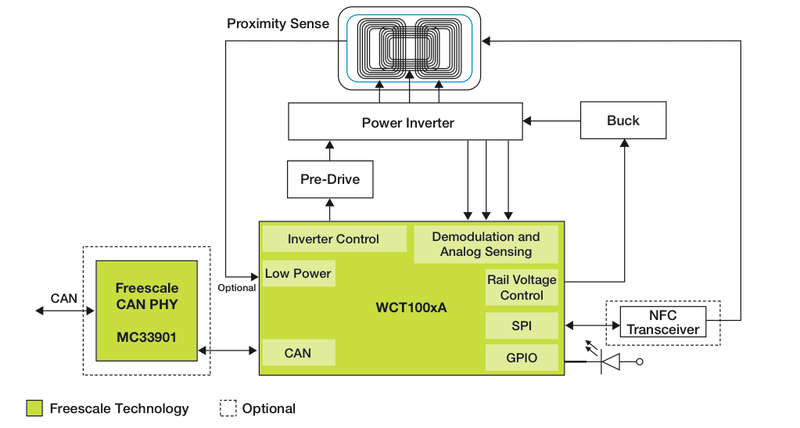 Through the combination of the respective expertise in automotive grade NFC transceiver technology and wireless charging, Melexis and Freescale Semiconductor have introduced a jointly-developed reference design (Figure 1). It includes all the hardware and associated software drivers necessary to permit fully autonomous operation of the wireless charging subsystem. The embedded NFC stack is controlled via a standard compliant NCI (NFC Controller Interface) and driven by a standard compliant upper NFC software stack (e.g. NFCStack+ from Stollmann). It deals with the coexistence of both Wireless Charging Transmitter (WCT) and NFC technologies on a single and easy-to-use module. Melexis has put itself at the forefront of NFC roll-out within the automotive arena with its MLX90132 multi-protocol transceiver IC, which is a fully automotive compliant (AEC-Q100 qualified) device that operates at 13.56MHz. The NFC analog part embeds a minimum set of components around the MLX90132 to make it functional as an NFC device, supporting the following communication modes: Reader/Writer, Peer-To-Peer (Initiator and Target) and TAG Emulation. It allows the transmitter to provide up to 300mW RF power to an appropriate antenna load. In the reference design this is complemented by a MWCT1003AVLH MCU from Freescale. The MCU supports the NFC low-layer stack and incorporates Freescale’s own unique wireless charging mechanism. The issue of co-existence is dealt with in hardware thanks to a specially designed on-PCB printed NFC antenna with an optimised matching network taking into consideration the detuning that results from the presence of wireless charging coils. The proposed architecture, including both stacks in one common MCU, allows the implementation of dedicated software handshaking to reinforce the co-existence of the two technologies. A first software version allows the sequential operation of the NFC and wireless charging activities, subsequent releases will allow the possibility to further enable transparent and simultaneous operations. The reference design’s embedded field and tag detectors mean that it has extremely low power consumption, reducing to a minimum the power dissipation of the final application. The electro-magnetic disturbance algorithm improves performances in both Reader/Writer and Peer-to-Peer modes. Automotive manufacturers are looking to integrate NFC technology into their new models in order to take care of a multitude of different tasks. With it being an integral part of both handsets and vehicles it presents automotive engineers with the means by which a variety of functions can be addressed, including wireless charging initiation, using an extremely low power wireless communication standard instead of having to rely on a more power hungry alternative.